Video gait analysis is used to slow and analyze walking (gait). Even when walking some of the movements of the foot happen so quickly they are hard to catch with the naked eye. By recording and slowing the walking motion we are more able to more accurately able to diagnose and treat foot pain. 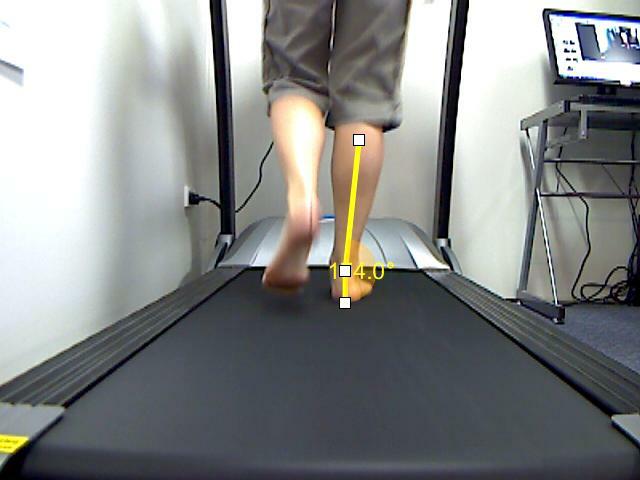 Below you can see an example of how gait analysis can help with the diagnosis of mechanical foot problems. You can see from the video that the heel rolls towards the inside when walking. This rolling in or pronation causes excessive stress and strain on the foot and lower limb. Problems similar to the below are often treated with custom made orthotics. By accurately measuring the extent of your foots pronation (or other abnormal motions) we are able correct any biomechanical abnormalities of the feet and lower limb. See below for an example of a pronated rearfoot measurement. If you are concerned about your feet please call our reception staff to arrange an appointment today. With the average person walking 10000 steps per day, this adds up to close to 150000 km in a lifetime. This is the equivalent of walking over 4 times around the earth. It’s no wonder that most people get painful feet at some stage in their lives. How Common is Foot Pain? Recent studies suggest that as many as 3 out of 4 people have suffered some form of foot pain over their lifetime. Pain is usually an indicator that something is wrong and needs attention, a sort of message from the body to change something. Video gait analysis an essential tool in correctly diagnosing foot pain.